It looks like Verizon Wireless may finally have a low cost brand to compete with the likes of AT&T's Cricket Wireless, T-Mobile's MetroPCS and Sprint's Boost Mobile and Virgin Mobile brands. 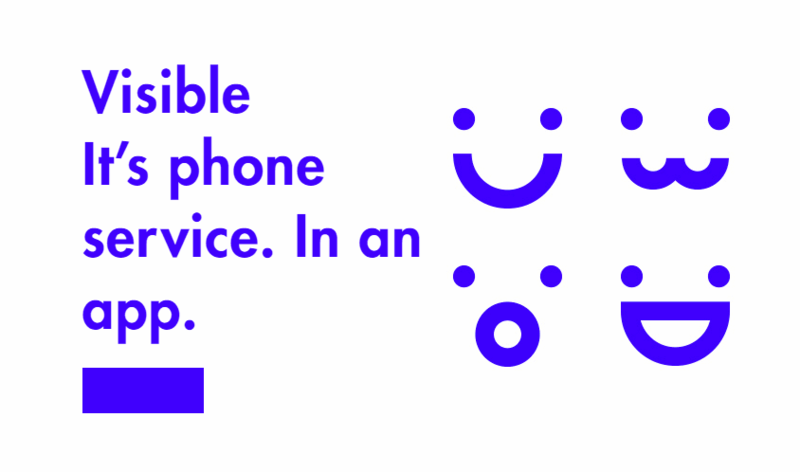 Visible is a newly launched wireless service provider. A representative of the company confirmed to BestMVNO that Visible is owned by Verizon but will operate independently from it. It's phone service. In an app. " Visible hopes to differentiate itself from competing platforms by offering service on "America's best 4G network." Visible is so named to represent clarity to the consumer. Visible offers one plan, and one price. 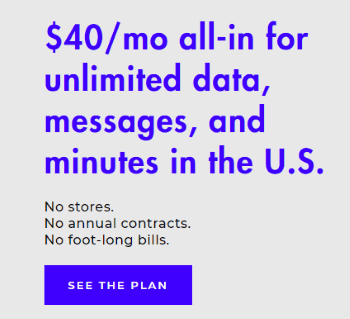 The service is priced at $40/month all-in, for unlimited talk, text and data with no annual contracts. Data speeds are limited to 5 Mbps with video streaming limited to a maximum resolution of 480p. There's nothing in Visible's terms of service about a data prioritization policy where data would slow down during times of heavy network traffic. Given that speeds are already throttled to 5Mbps, they may not have one. Service is available by invite only, so if you're interested in service, you need to get an invite code from a current subscriber. For the time being, only iPhones are allowed on the network. Most iPhones will work on Visible with the exception of the iPhone SE and some iPhone 7 models. Android support will come at a later date. Despite not wanting to be known as a prepaid wireless service provider, Visible's terms state that "the availability of service depends on your payment in advance of the monthly charge when it is due." This would seem to indicate that their plan is in fact prepaid. Visible accepts Venmo, PayPal, debit and credit cards for payment. Wireless network and device information such as your IP address and connection speed, mobile number, device and advertising identifiers, browser type and operating system. Visible says that it will use the data collected to deliver service to you, market to you and for other business purposes. Other business purposes include sharing certain information about you with affiliates for marketing. Visible states that you can limit the sharing of certain types of information by opting out of it. Some of the types of tracking would seem to be par for the course, such as tracking calls and text messages. However, tracking what applications you are using and the websites you visit may be a bit off putting for some. I just wanna know who the f*** to call and find out why my phone service is off just because my internet is turned off. My internet is with Spectrum and it was turned off yesterday so I have no cable. internet OR phone. Gas lighting jerks. Don’t get this crap. You leave your driveway, NO PHONE SERVICE TIL YOU HIT A HOTSPOT. S-U-C-K-S!! IM OUT!!! I just subscribed to the service and live in Alaska. I’ve been in communication with customer service a few times already and have experienced no issues. They’ve been very quick to respond via texting and chatting. I also asked them about the hotspot, and they indicated twice that using the phones as a hotspot is totally allowed and unlimited at the same throttled speed. They seemed to have opened up hotspot after the initial launch due to user requests and complaints. Did they fix it for you, or is the bug still flying around? The app is only for setting up service and paying your bill. Everything else is as any other cell service on the iPhone. Their customer service is atrociously bad. The worst I have yet encountered. The LTE only service is also not very reliable. It seems Verizon puts Visible on the very last priority when it comes to calls, texts and data. The calls are choppy, texts are delayed and data is slow. I will not renew next month. You get what you pay for. Thanks for the tip. They also don’t seem to be very forthcoming in dishing out information about their service, at least for now. Doesn’t make much sense to me. I am on Visible. Calls and texts are with native IOS apps, not some custom app. The service seems fine, but we did experience an outage today while while Verizon’s network was fine. That’s a little disconcerting. What then is the app that they are marketing? They are marketing it as if it’s required to be installed for calls and texts.The company has not been all that clear. Is it just for payments like many other companies already offer?